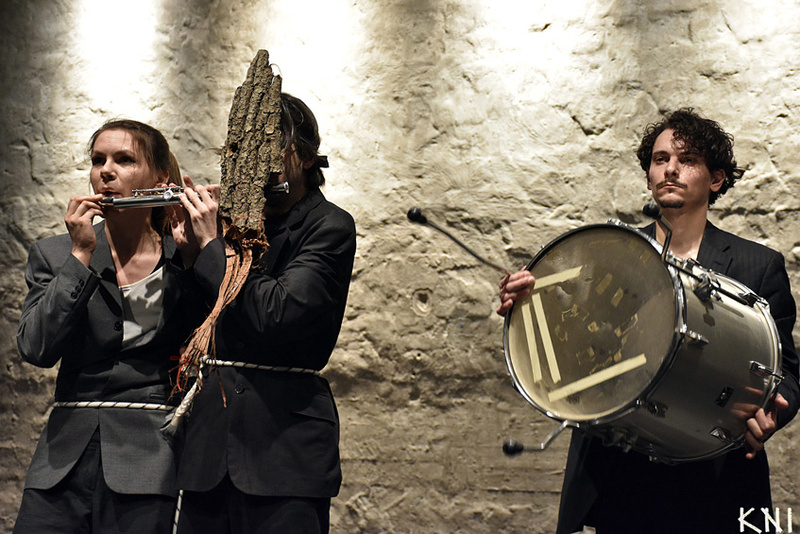 Keeping in mind the main goals of Ziggurat Project (the creation of multi-disciplinary performances born in real co-operation) we stage Roland Acsai’s modern Noh drama with tools of physical and object theatre, accompanied by improvisational live music employing unconventional methods. The dancers and the musicians appear in more functions in the performance. We consider especially important the cohesive interaction of Japanese and Hungarian traditions. 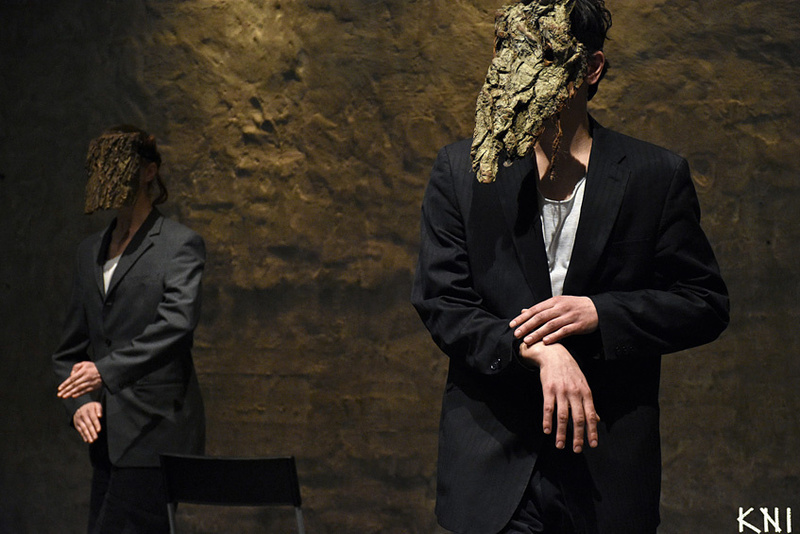 Esumi and Asao aims to give an answer to how Japanese traditions can be accepted, reinterpreted and expressed in our own theatrical language as Hungarians. Development of movements is preceded by intense research that incorporates Japanese ceremonies (kaguras), traditional (noh) and contemporary dance (butoh), martial arts, Zen philosophy and meditation practices and melodies, as well as Hungarian mask traditions, folk dances and folk songs – with equivalent character of the Japanese pentatony. The musical concept is the creation of a soundscape in which traditional Japanese music is born with correlation of Hungarian folk and classical music. The instrument and the way of musical expression was realized in the improvised composing of a bound unity and format system in the light of preliminary research knowledge, faithfully to the dramaturgy of the work. Like the role and musical narrative of Japanese music in noh theater, the aim was to create a powerful, cathartic musical atmosphere - linked to the content elements of the dance choreography - which "stops the time" in the Eastern sense. "... the lean form that Kalmár puts together on visual, movement and musical level is valid in itself and stops on its feet. 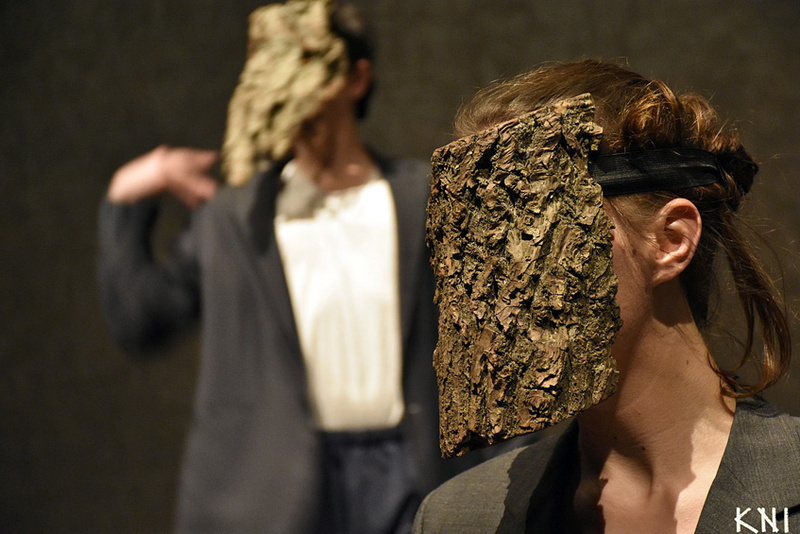 The one-eyed, bark-crafted masks – which are also inspired by the noh theatre - are good and apposite, because they are suited to this cold formalism. It is a clever how the determining minimalist movement and gesture language opens up to more vibrant contemporary dance and martial arts elements and in the end to Hungarian folk dance, to slow forgatós, without any hitches. " "... they did not strive to give the impression of an authentic noh performance but inspired from this tradition. They used signals that can be interpreted by the Hungarian viewers as well, even if they have already met that sign, even if they have not."